On Friday, former Finnish President Martti Ahtisaari won the $1.4 million (10 million Swedish krona) Nobel Peace Prize for his 30-year work as peace mediator on different continents and for his contribution to settling the Kosovo conflict. Naturally, millions of people in Russia, Serbia and dozens of other countries will be enraged because Kosovo is not a classic example of a peace settlement. On the contrary, the conflict highlights a situation when the Kosovo Liberation Army (KLA), a terrorist organization, used the most brutal methods, including armed force, to expel the Serbs from their native lands. However, KLA attacks met with armed Serb resistance. In 1999, the United States and several European countries decided to support the KLA and enabled it to establish control over Kosovo, thanks to a plan formulated by UN Special Envoy Martti Ahtisaari in violation of international law. Now Kosovo is a Taiwan-style territory which is officially recognized by some nations and shunned by others. But at least there is no more warfare there. In 1999, NATO launched air strikes against Belgrade and forced it to cede Kosovo to the Albanian diaspora. Had the Kosovo conflict erupted after September 11, 2001, the situation could have been different because the international community had changed its opinion of terrorism and armed separatism after the 9/11 attacks in New York and Washington. Nonetheless, the issue is still being debated. 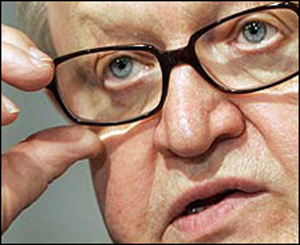 The awarding of the 2008 Nobel Peace Prize to Ahtisaari is probably the most scandalous decision in the past 10-15 years. However, the decision highlights all-out disagreements between the international community on some key issues, including war and peace, justice and legality. The Norwegian Nobel Committee's controversial decision has sparked a lively debate that will continue for a while. This and other similar decisions will always be controversial because the loosing side in a conflict will feel that it has been treated unjustly. Peace enforcement also served to aggravate the situation in the former Yugoslavia. The Committee should therefore look for different approaches and promote other candidates, rather than career diplomats like Ahtisaari. In the last few years, the Norwegian committee has awarded the Peace Prize to many people who have had nothing to do with peace-making or the prevention of wars. In 1996, East Timor's outspoken and often fiery Roman Catholic bishop Carlos Belo and an exiled activist, Jose Ramos-Horta, shared the Peace Prize "for their work toward a just and peaceful solution to the conflict in East Timor." That was an obvious setback for the Nobel Committee because the East Timor conflict escalated into a bloodbath just three years afterwards. Even today East Timor can hardly be called a normal country. Similarity between East Timor and Kosovo - Ahtisaari is obvious. The 1997 Peace Prize went to American teacher and aid worker Jody Williams for her work in the banning and clearing of anti-personnel land mines. The UN and UN Secretary-General Kofi Annan received the 2001 Peace Prize, seen by some as an obviously predictable and trivial gesture. In the last few years the Committee was prone to improvisation. In 2006, the Nobel Peace Prize went to Professor Muhammad Yunus and his Grameen Bank for efforts to create the foundations of socio-economic development. Professor Yunus who invented micro-finance, namely, collateral-free loans, a powerful tool for fighting poverty worldwide, probably deserves a Nobel Economic Prize for this landmark achievement. The 2007 Peace Prize was awarded to former U.S. Vice President Al Gore and the UN Intergovernmental Panel on Climate Change. Although global warming is a major problem, it has nothing to do with peace-making. It appears that the Nobel Peace Prize will soon be presented to international celebrity activists. The choice of Nobel Prize winners inevitably has a philosophical side. The Nobel Committee often faces the dilemma of awarding scientists who have discovered new killer bacteria or a potent medication. The painful choice may have far-reaching implications because the medication could prove useless within the next 50 years, while the discovered germ could prove a work of genius, because once discovered, it can eventually be destroyed. The Nobel Prize in Literature has even more profound philosophical implications because the Committee can either award a well-to-do bestselling novelist or some obscure author who can change public taste. However, the public may not be interested in changing its taste. Predictably, the Nobel Committee now prefers to award cosmopolitan writers preaching the global merger of cultures. True, awarding the Peace Prize can be a difficult challenge, but not that difficult as to lose any relation to peace. Some prospective candidates are human-rights, rather than peace, activists. But modern human-rights activists are more like political and ideological fighters than selfless champions of peace. Although the Nobel Committee tried to select a classic peace-maker this time, its decision has caused discontent. Let's not forget, however, that the decision was made by a group of individuals representing a rival global political philosophy. If the voting for the Nobel Peace Prize had been held at the UN, or better online on a global scale, the result would have been quite different. Let's hope this will happen in the future. For the time being let's be grateful for what we have today.